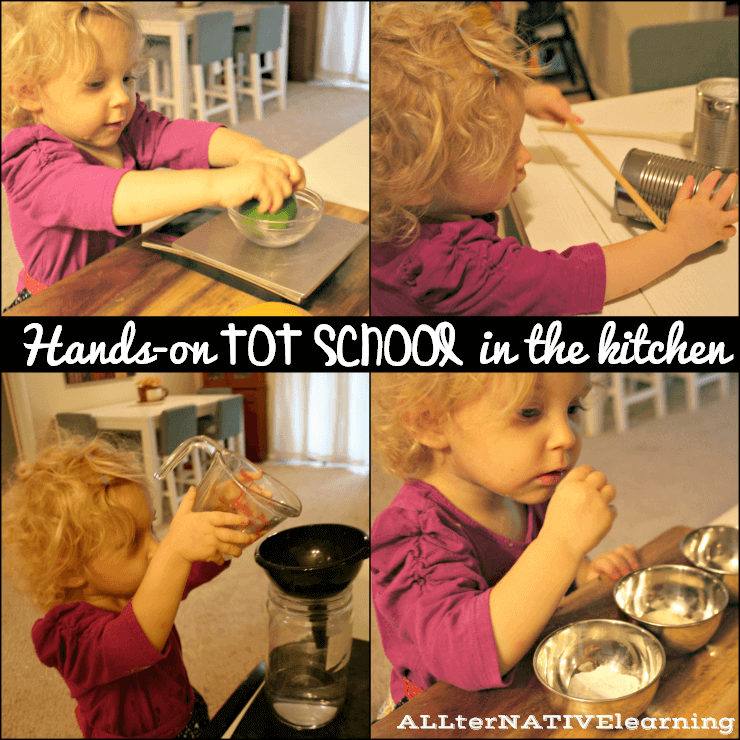 Learning in the kitchen is a fun way to engage toddlers. I know that my 20 month old is obsessed with food right now, making this tot school theme more appropriate than I realized when planning almost a year ago. 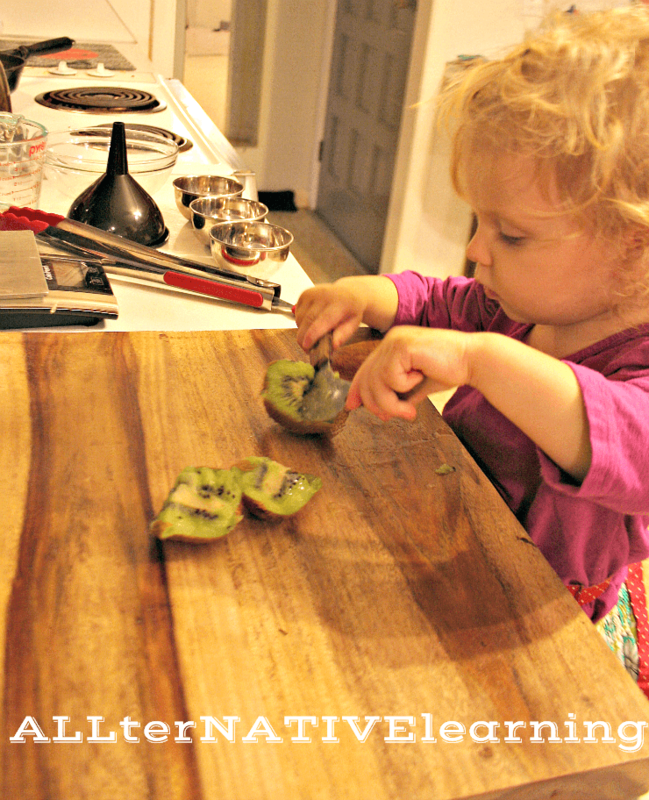 Because life caught up to us and we are behind in tot school, learning in the kitchen has combined two themes into one. We explored both the kitchen and its tools in general as well as food and taste. Needless to say, it was a fun-filled week that will continue to be a part of our play and learning regiment. Thank you for choosing t support our family by purchasing materials through our affiliate links. What a great week to review so many great concepts from preview weeks. 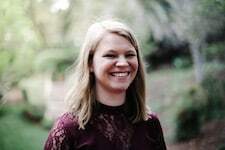 For instance, it’s a fun time to review colors by reading books that explore eating a rainbow and even introduce newer concepts like the alphabet and read the classic by Lois Ehlert, Eating the Alphabet . While you should probably have plenty of materials and supplies to get cooking in the kitchen with your toddler, the one thing you may not have is a toddler-friendly knife. We personally have a two-handle rocker knife that is fairly dull. It allows her to hold both sides and cut easily. We also have a one handle rocker knife, but do not use it quite as much because it’s much sharper. If you cannot find an appropriate knife or you are not comfortable introducing a knife to your toddler at this point, you may consider a play set and wooden knife like the Plan Toy Fruit and Vegetable Cutting Set . However, in my personal opinion, I believe that it is important to teach knife skills, safety, and respect early regardless of what form works best from family to family. We personally have a very small wooden play kitchen from PLAN toys and then some great wooden and metal pots, pans, and utensils from ALEX toys. While this isn’t completely necessary, it was a fun way for our daughter to learn a little more about food and the kitchen while playing independently. Gadgetology: Kitchen Fun with Your Kids is a really cute and handy resource to have while exploring the kitchen with kids. Not only does it have recipes and what gadgets to explore and how, but it also has unique ways of using kitchen gadgets to make them play-things. Definitely one of the best tot-school book purchases I have made thus far. Have a kitchen music festival. Our music festival included tin cans, chop sticks, whisk maracas, pots, pans, and wooden spoons. We had a blast making all kinds of fun and unique sounds with items from around the kitchen. This is just a fun way to introduce learning in the kitchen and incorporate music in the process. Explore the gadgets around the kitchen. Find those egg separators, tongs, colanders, egg timers, and more. Let your child have free play just exploring what they are and what they do. Try out some games with those gadgets. Pipe Cleaners and colanders is always a classic. We also played with kitchen gadgets outside and had a blast with water play. 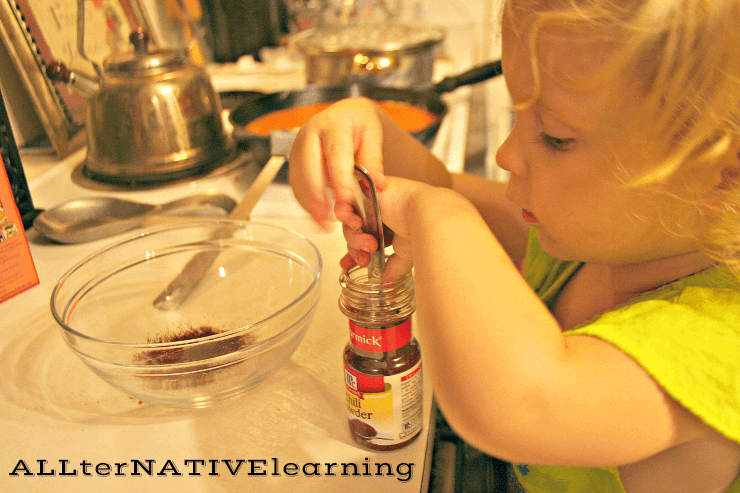 Wednesday – Start having your child help you cook dinner and continue through the week. You may even consider showing them different ways to cook (stove, oven, griddle, crock pot, etc.). They can be involved in tasks like stirring, whisking, scooping, and more. One night I couldn’t have my daughter help much, but she entertained herself and stood beside me twisting the salt grinder. Some kids can even set the table and pour drinks to help prepare for dinner. Thursday – Have a tasting day. Make everything about how things taste. We started this process by putting out bowls with sweet (sugar), Salty, and bitter (cream of tartar). This gave her a basis for how things tasted different. Then we would taste food and talk about if it was salty or sweet. We talked about how kiwi was kind of sour and enjoyed lots of different tastes. This was also a great time to bring up the old theme of body parts because we discussed how we taste with our tongue. Friday – Free Play. This was a day where we read our books, played with food-related puzzles, and I let her explore more learning in the kitchen by playing with her “play kitchen”. It was just a fun way to explore learning in the kitchen through independent play. Saturday – Grill outside or go to a restaurant as a family. This is a fun field trip in a way. Even grilling would be a field trip for eating because it happens outdoors instead of in the kitchen. Weekends are always a fun time to spend with family and especially around a meal and that can be the topic of learning conversation. Sunday – Make sandwiches, bagged lunches, or a sweet treat to feed someone in need. This means you can make cookies for an elderly neighbor or your toddler can help make bagged lunches to take to a homeless shelter. Whatever the need is in your community and at your comfort level, help show your child the need to feed the hungry. Maybe even look at donating canned goods to a school or charity. Bible Verse of the week Matthew 14:13-21 – Jesus feeds the 5,000. Spend time talking about what it means to feed someone else, especially when in need. There are people around the world needing food and discuss how we can be a blessing to others. Find more tot-school themes and inspiration by exploring all of the ones we have completed.